Ryal Harris has completed a clean sweep in Round 2 of the East Coast Bullbars Australian V8 Ute Racing Series at the Watpac Townsville 400 today, winning Races 2 and 3. Following his Race 1 win yesterday, Harris had to start fifth in Race 2, courtesy of the reverse-grid format, but quickly worked his way through to second place before passing Kim Jane mid-race and driving to the win. He became the first driver to score a Utes clean-sweep since Cameron McConville at the Sydney 500 in 2012. “Kim didn’t make it easy for me to get past – it took me a couple of attempts at turn 2 before I was able to make a move stick,” Harris said. Jane finished second in Races 2 and 3 to finish second overall for the weekend – amazingly, the Bob Jane T-Marts driver has finished now finished second for six races in succession. By virtue of his consistency, Jane has retained his lead in the points, and said it was an enjoyable weekend. “With the 50kg of success ballast, I always knew it was going to be tough to beat Ryal this weekend, but I had a lot of fun and it was good to come away with another solid bundle of points,” Jane said. Craig Dontas finished third for the round despite falling to seventh with a spin in Race 2. Dontas chased Jane home in Race 3, and said it was good to be back in the series. “I was battling to make up positions in Race 2 and just spun on my own,” Dontas said. Rookie racer Michael Sieders finished an impressive fourth for the weekend, highlighted by his run to third in Race 2 during which he diced with the leaders. 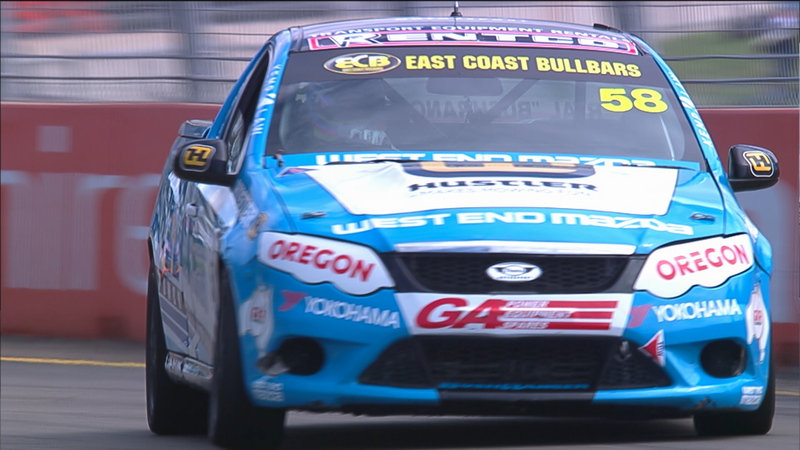 Craig Woods juggled double duty with the Aussie Racing Cars to finish fifth overall ahead of Marcus Zukanovic, who held onto third in the series standings. Blake Sciberras was seventh for the weekend ahead of New Zealanders Matt Spratt and Peter Ward – who spent much of the weekend battling one another – and veteran Richard Mork completed the top 10. The next round of the Australian V8 Ute Racing Series is at Queensland Raceway, 28-30 July.